Perform non weight bearing range of motion exercises pre operation. The nature of arthritis and the first impact you will feel is the stiffening of your hip joint which decreases range of motion. Your goal will be to maintain as much range of motion as possible, but within your pain free range. 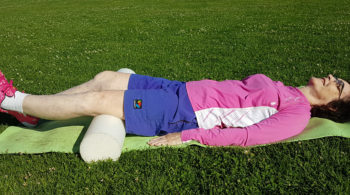 Gentle guided range of motion exercises where the weight of your body is supported will help to loosen the hip joint and prevent further loss of range. The stationary bicycle or pool are great options for this. You could also have a physiotherapist or personal trainer show you exercises. Strengthen your gluteus medius and gluteus maximus muscles! These two muscles strengthen and stabilize the hip joint. They are the muscles that will atrophy or weaken first with the pain and lack of use of your hip due to arthritis. There are numerous exercises you can do for these muscle groups and the strength in these muscles will determine the success of your recovery post surgery. it is imperative you strengthen these muscles. Stretch tight muscles that may limit your ability with daily tasks. The muscles that become tight with hip arthritis and hip replacement include the following: hip flexor, hamstring, quadriceps, illiotibial band, calves. By stretching these muscles you will improve your range of motion, walk with better gait, stand taller enhancing your posture, and decrease aches and pains associated with tight muscles. Make sure you walk a lot post hip replacement surgery. Walking daily post surgery for a time or distance suitable to your ability will really help your recovery, increase your stamina, and strengthen your hip. Walking is the number one cardiovascular option to strengthen your hip post surgery above cycling, the elliptical, and the pool. One leg balance exercises are extremely important to build back hip stability and improve your gait. 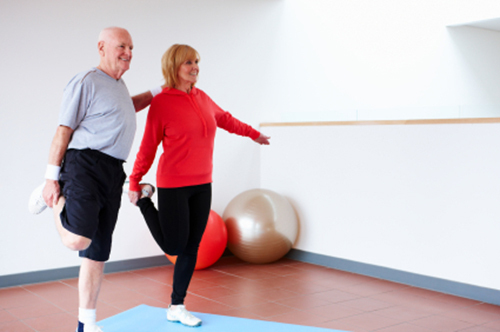 If you are living with hip arthritis or pre operation, then one leg balance exercises may be too painful; however, if you are post hip replacement surgery, then gradually introducing the one leg balance exercise two to three months post operation is really important. If you have weak muscles or are a heavier set person, then you may need to wait longer to introduce the one leg balance and you will need to strengthen your muscles first. Include unilateral or one leg strength exercises into your exercise program and do sets on both legs. The leg with hip arthritis can become very weak or at least weaker than your other leg. Performing one leg muscular endurance exercises such as the shuttle or step ups are excellent for balancing the strength between your two legs. When the strength between your two legs is imbalanced, it can lead to poor gait, postural deviations, muscle shortening, and possibly pain. Strengthen your core muscles which include the deep muscles of your abdominals and your back. Having good core muscles will stabilize your pelvis, improve your posture, and help both your gait and balance. These muscles will most likely weaken due to the progression and pain associated with arthritis. When you include exercises in your routine for these muscles, they will assist you in your activities of daily living. The most important muscle actions or movement patterns that are a must in the pre and post exercise program are hip extension and hip abduction. There are non weight bearing and weight bearing exercises for these two movement patterns so they can be done for people with hip arthritis pre surgery as well as post surgery. When you include these movement patterns into your exercise program, you will be dynamically stretching the hip joint and strengthening it simultaneously. Even if they feel difficult, they often feel good to do or make you feel better after doing them. Attend to your posture by implementing corrective exercises. 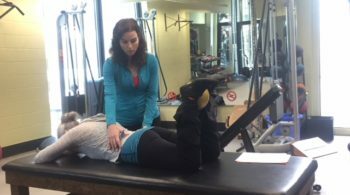 There are sometimes drastic postural changes that happen when people suffer with hip arthritis for a long time. These deviations of posture are caused by tight muscles, hip pain, instability in balance, and range of motion limitations. Stretching these muscles that become shortened and strenghtening the muscles that become overstretched and weak will improve your posture. Make rest, nutrition, and weight management part of your overall hip exercise program. Eating a nutritious diet is important pre and post surgery for optimal recovery. Keeping your weight in a healthy range will reduce the overall load on your hip and not only speed recovery, but improve your overall functional ability. Taking rest days from exercise will allow the joint to heal and give the muscles the time they need to grow. Too much exercises will most definitely set you back and impede your progress. I have seen this happen often! Two days of exercise in a row should be the maximum. You are an integral player in the daily management of your arthritis and your recovery from surgery. Exercise in the form of range of motion, stretching, strength, and cardiovascular conditioning will hugely impact your independence, confidence, and overall feeling of well being. Start here with these ideas to build yourself a strong, supple, well functioning hip joint. Good luck! « Previous Post VIDEO: Hip Strength Exercise for Hip Replacement Surgery Next Post » What are the Best Exercises for Hip Replacement?